The other week, this Melbourne girl ventured up north for a weekend trip to rival city Sydney. I have to admit, I had big plans for epic foodie adventures which, due to unforeseen circumstances, did not come into fruition. It ended up being a weekend of greasy, guilty pleasures instead of the fine dining I was anticipating. The weather was nice though, and it was comforting to know that I wasn't missing out on anything special down in Melbourne (except for maybe Brody Jenner and Whitney Port being in town for the weekend! *dies from FOMO*). K and I went up to visit the former boss who'd made the tree change while I was in Shanghai. After a busy morning of catching up and site seeing (typical picture with the bridge and the opera house), we were struck with pains of hunger. The boss asked if we were up for some authentic German - apparently much better than any of the so-called 'authentic' German restaurants she'd been to in Melbourne - to which we both happily agreed to. So Lowenbrau it was. 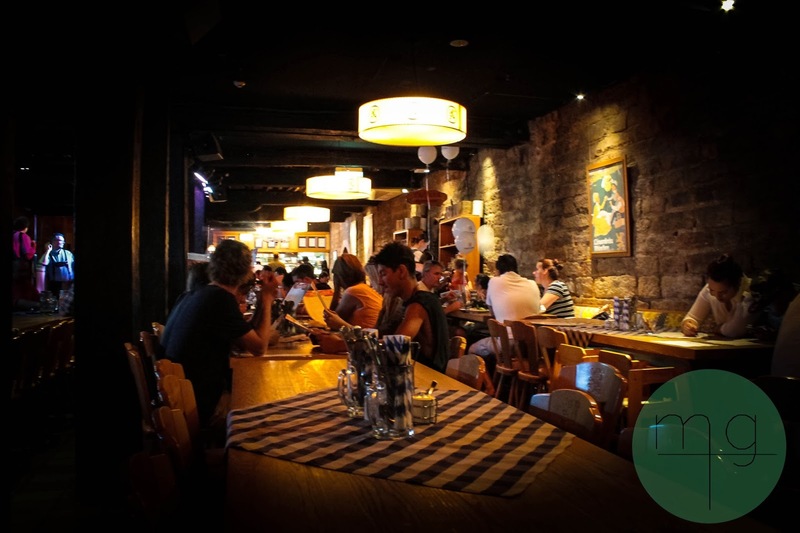 We crossed the harbour and headed towards the Rocks to delight our German cravings. Upon arrival I was made to feel like there was some big festive occasion going on. 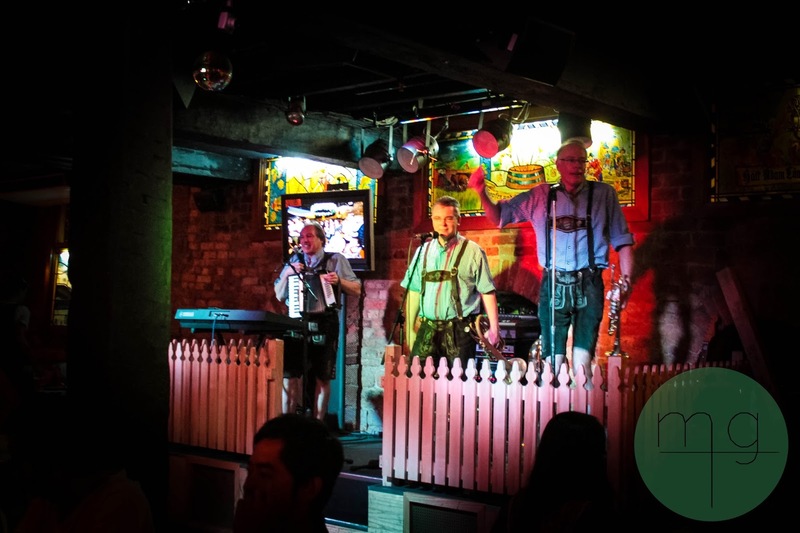 Accordion music was pumping, beer jugs were clinking, older leder-hosen clad men were yodeling, and the food was overwhelming. Even as we entered, we were greeted and smiled at by the yummiest looking Bavarian waiter, who sparked up my appetite even more. "I can't take your order" and went to go retrieve our original waitress. She appeared to be pretty clueless and surprised that we seemed so eager to order after being given almost 10 minutes to make our decisions. 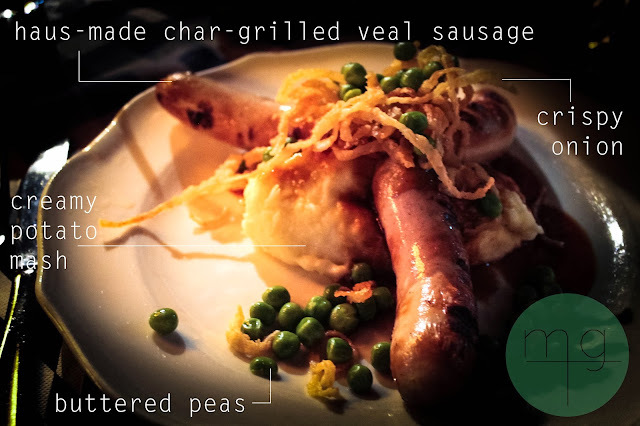 After spotting the haus-made sausage menu, I became hungry for some cheesy kransky goodness, but the only option was a sharing platter made up of a variety of sausages, including kransky. So I went for the next best thing. The "Kesselfrische Kalbsbratwurst" - my boss thought it would be funny to hear me attempt to pronounce this. The waitress seemed to understand though so I must have said something right! Unfortunately, not the most flattering of presentations, or photographic angles for that matter *insert a crude sexual joke about German sausages* but flavour-wise, it was like a true emulsified meat frankfurter, made and smoked in house and then char-grilled to give the skin a bit of extra crunch. Unlike the Polish weiner/frankfurter version I was used to growing up, this had a slightly milder spice, but was just as firm and smooth in texture, with a great smokey, delicious flavour. The mash was creamy, so creamy in fact it seemed too good to be true, and I wondered whether in fact it was made from a packet of instant mashed potatoes. The crispy onion was a little more soggy than crispy but I suppose it did the job. 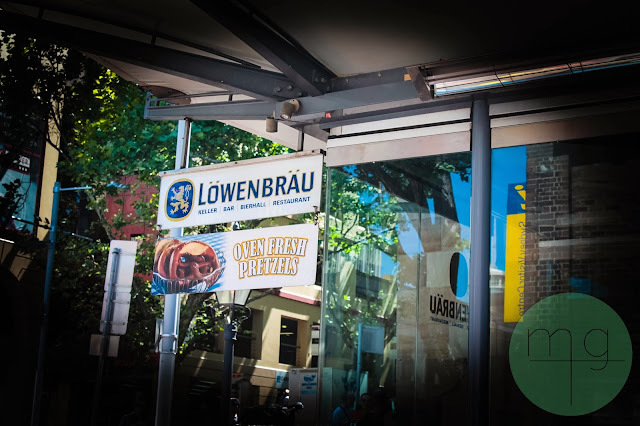 Overall, I can't say Lowenbrau lived up to my boss' hype - and even she admitted it must have changed management since the last time she had been there. Not even my Bavarian boy could salvage the experience for me, he never made contact with us again. The Bavarian atmosphere seems to be a tourist ploy to get people through the door, but as soon as you pass through, the bravado is dropped.